This HD Series Component Video Cables are precision engineered to provide superior HDTV picture quality and excellent HD video signal integrity for interconnecting your DVD players, digital cable box, satellite receiver or AV receiver to any HDTV set, Projectors, Plasma TV or LCD TV. 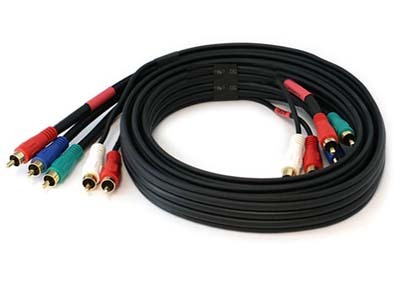 This 5-RCA component Video/Audio coaxial cables are made with RG-59/u coax cables. Coaxial cables provide excellent shielding from signal interference. The connectors are molded on with a built-in strain relief neck, gold plated tips. Dual EMI/RFI shielding technology with thick polyethylene dielectric to precisely transport the RGB component video and stereo audio signals to the end display terminals. Also featured with high grade oxygen-free copper coaxial wire to prevent signal degradation, you are guaranteed the best quality for your high definition pictures and crystal clear sonic quality. 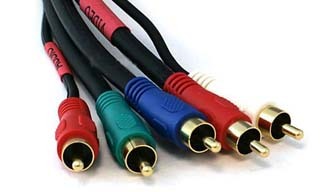 This RGB A/V cable is also labeled on the comfort-grip connection molding with the industry color codes of Red, Green, Blue for HD video and Red/White for stereo or digital coax audio for professional video and audio installation with ease. This HD component A/V cable can be used to carry 2-channel stereo or coaxial S/PDIF audio along with the HDTV signals together. 5 RCA connectors of 24K gold plated corrosion free split-lock ring for excellent electrical contact and corrosion prevention. Precision 75 Ohm Impedance for maximum signal transfer. Constructed with triple heavy-duty super shielded RG-59/U coaxial cable to maximum signal transfer and minimize interference. Extended up to 1 GHZ bandwidth. Dual EMI/RFI shielding technology with thick polyethylene dielectric. Supports both 2-channel stereo and coaxial S/PDIF audio transmission along with the HDTV video signals together for single cable run. Maintains the HD video and audio signal integrity all the way. No loss, noise and free of distortion. Supports all HDTV resolutions including 480i,576i,480p,576p,720p and 1080i.